Omaha Door & Window Co. has a patio door for you. 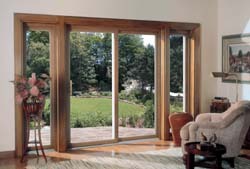 Soft-Lite, Weather Shield, and Park-Vue offer a large selection of quality patio doors at a reasonable price. You can choose a sliding, single swing or french double swing design. Weather Shield offers five types of wood; pine, oak, maple, cherry and mahogany with exterior choices of aluminum clad, vinyl, prime painted, finished painted with standard colors and finished painted with custom colors. Omaha Door & Window Company offers installation, remodeling and removal of the old door by our experienced installers. Let our professional sales staff answer any questions you may have. Independent Third-Party AAMA Gold Labeled Certified R-25 performance rating. Air Leakage – Rated at .09 cfm – 3.3 times better than minimum of .30 cfm. Water Leakage – Rated at .38mph – 15% better than minimum of 33mph. Design Pressure – Rated at 121mph – 29% better than minimum of 94mph. Two Solid Brass Heavy-Duty Tandem adjustable rollers on each door panel ensures Smooth & Easy Sliding Panels. 7/8” Tempered Safety Glass available in Double or Triple Pane Glass. Solid Fiberglass Heavy-Duty Sloped Sill that will never rot or warp. Extruded T.065 Aluminum Reinforcement in all vertical stiles. Dual-Fin Anti-microbial Weatherstripping fights mold & mildew while keeping the weather out. Exclusive Soft-Lite Interlock ensures an airtight seal every time the door is closed. Durable Miter-Joint Extruded Aluminum Screen Door Frame resists twisting, warping, & falling off the slide rail. Optional four-point multi-directional locking system . Optional heavy-duty patio door vent stop adds security while allowing ventilation. Handle set available in natural varnished wood, polished brass, or brushed nickel-finish. Choose a center-hinged atrium swing patio door with a fixed sidelight panel or a more traditional side hinged French style door with both panels that operate. Reinforced door panels and mainframe with Extruded T.065 aluminum. High Security Four point Multi-Locking System comes standard. Two steel locking bolts are actually hook-shaped to reach out and grab the side jamb for maximum strength & security and optimal pressure against weather-stripping. Adjustable Hinges ensure proper alignment and tight seal of door. Hardware available in Brass and Chrome. Independent Third-Party AAMA Gold Labeled certified R-50 performance rating. Air Leakage – Rated at .07 – 4.3 times better than AAMA minimum of .30. Water Leakage– Rated at .54mph – 64% better than AAMA minimum of 33mph. Design Pressure – Rated at 171mph – 82% better than AAMA minimum of 94mph. Air Leakage– Rated at .10 – 3 times better than minimum of .30. Water Leakage– Rated at .51mph – 54% better than minimum of 33mph. Design Pressure – Rated at .162mph – 72% better than minimum of 94mph. Weather Shield Wood Sliding Patio Doors interior door panels are available in Pine, Oak, Cherry, Maple, Mahogany, white Latex, Poly I paint and primed. The exterior is available in aluminum clad, white vinyl, prime paint and finished paint. Door rollers have two sets of tandem steel wheels with ball bearings for smooth operation. Wood frame members and door panels members are treated with water-repellent preservatives. Several tempered glass options are available, includingZo-e-Shield™, Weather Shield’s most energy-efficient glazing system. Wood handle lockset is standard. Bright brass single and multi-point locksets are optional. Weather Shield Wood Swing Patio Doors gives you a beautiful, open view, as well as a range of sizes and options to choose from. Weather Shield’s Clar-vu swing patio door is extremely energy-efficient and secure. The interior door panels are available in Pine, Oak, Cherry, Maple, Mahogany, white Latex, Poly I paint and primed. The exterior is available in aluminum clad, white vinyl, prime paint and finished paint. Wood frame members and door panel members are treated with water-repellent preservatives. Several tempered glass options are available, including Zo-e-Shield™, Weather Shield’s most energy-efficient glazing system. Single-point bright brass lockset is standard. Optional single-point and multi-point locksets are available in bright brass, antique brass, chrome and white. Weather Shield Vision-3000 Vinyl Sliding Patio Door uses multi-chambered construction to ensure superior insulation and fusion-welded corners to deliver both strength and rigidity. The sliding door features two sets of high-quality nylon ball-bearing rollers and a stainless steel track that withstands continuous sliding for smooth and easy operation. The Vision-3000 vinyl door is constructed to last through the seasons without peeling or corroding. Aluminum stiffeners are inserted to the handle area for added security. Several tempered glass options are available including Zo-e-Shield™, Weathershield’s most energy-efficient glazing system. Available in white or tan colors. Park-Vue Wood Sliding Patio Doors are completely reversible and can be set up with either panel operating. This can be accomplished even after installation. Wood sash and frames are fashioned of high-grade western pine, treated with a water-repellent preservative. A durable pultruded fiberglass sill reduces conductive heat loss and condensation. Double weatherstripping and rigid vinyl interlock with woven pile ensures weather tightness. Choose from 1″ tempered insulated glass or high-performance argon filled Low-E glass. Maintenance-free external cladding option is 100% extruded aluminum with color choices that are compatible with those of popular window and exterior trim manufacturers. Park-Vue Wood Swing Patio Doors can be set up for right or left handing at the job site because all components are pre-machined for fast and accurate bolt-together assembly. Wood sash and frames are fashioned of high-grade western pine treated with a water-repellent preservative. No-warp construction is engineered into each door stile and the locking stile consists of a laminated core to ensure stability. French Swing (both panels swing) is available. Choose from tempered insulated glass or high-performance argon filled Low-E glass. Maintenance free external cladding option is 100% extruded aluminum with color choices that are compatible with those of popular window and exterior trim manufacturers.